How do we share our homes with our four legged friends? We love our homes: we want them to be stylish and comfortable, inviting and cosy. We love our pets too, and as they are very much a part of our lives we incorporate things into our homes to make them more comfortable. They are a part of our family after all! However, these particular family members can be a little more work than usual. They don’t pick up after themselves and can be messy eaters. They often shed and are not too good at wiping their feet after a walk. They also think they are actually human so like to enjoy the furniture as much as we do! That’s all fine, but they do add a considerable amount of extra wear and tear to our furniture and homes. So, looking for ways to help minimise this impact can be challenging. Tiles are the perfect solution for all floor areas, and microfiber upholstery fabric for our sofa and chairs. This about the best thing to use on furniture in our climate anyway. A good quality, thick microfiber will stand up to a great deal of use—and misuse, especially from heavier dogs with big claws. It cleans up very easily and can be vacuumed and brushed to look good as new. There are solid-colour microfiber fabrics, but now we also have many great textures and prints available in the same type of fabric. If your pet arrives after the sofa, one easy solution is to add a pet blanket over the chairs or sofas they like to sleep on. These are easily washed and will reduce stains and fur build-up on your sofa—and you! Or…. you can give them their own bed. This can be something to fit style-wise into your own interior, a trendy designer bed, or be practical and creative like incorporating it into a coffee or end table. The latter pure inspiration for those who may be short on space but big on design! Bathing your pets often will help too, and to make this easier have you ever considered a dog cleaning station…? These are a great and very practical option—imagine, after a trip to the beach or a walk in the rainy season being able to clean your dogs off before they get in to the house! 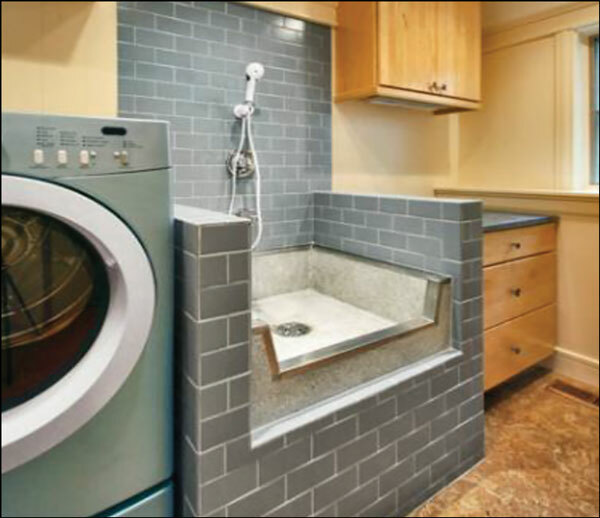 Think about adding one outside or even in your laundry room if space allows. Install a hand shower and raised ‘tub’ to reduce back stress—yours, not theirs! And if your pooch is small or getting on in years, adding a couple of steps helps encourage them up there. If you prefer your pets to sleep outside (and feel creative), then you can create the “doggie digs to die for”. Today there are dog houses that are beyond imagination. They can match the style of your house with a retro or modern look, or look like a Swiss chalet or Spanish hacienda. You can even add a bone shaped pool for cooling off. I actually saw a pooch-sized RV that had been fashioned after an Airstream trailer! We have come a long way from the days of the simple colour-coordinated bandana. We now have designer duds for our faithful friends—pet paraphernalia is big business. There are doggie booties to keep their feet clean and dry, and Doggles, for when they stick their heads out of the car window. Paris Hilton famously popularised the dog-accessory bag and now we have superman costumes, life-vests, car seat belts, and every type of clothing accessory for dogs. 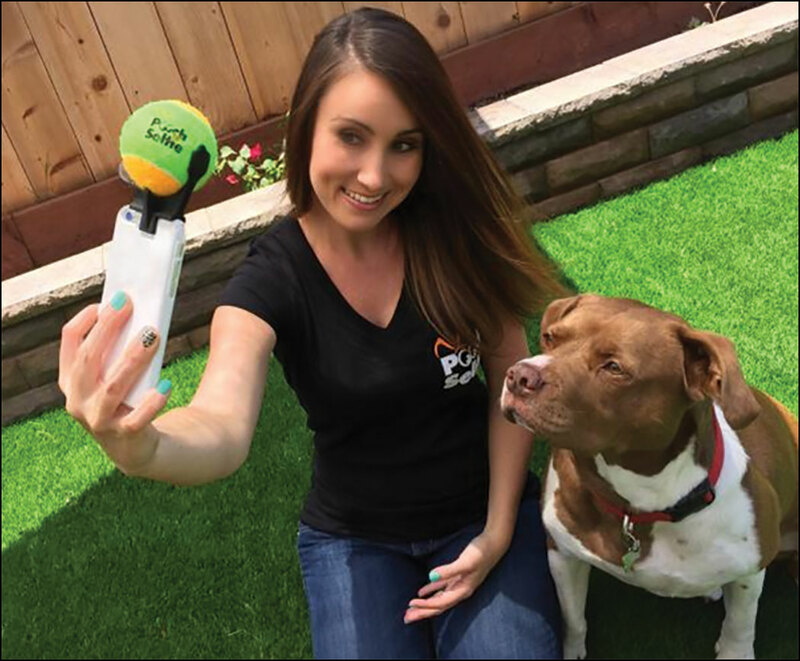 Trendy pet accessories are popping up all the time but one cool thing I saw recently was a pet selfie-distractor. It is the perfect way to get a great photo of Fido. The Fitbit bracelet that tracks and monitors our daily physical activity, now has a version for our canine friends too—Wonderwoof. Yes, I am not kidding! This bone shaped addition to the collar will accurately track their activity levels, but it will also remind you of your dog’s vet and grooming appointments, and will even set up a social network for him or her. Are they actually becoming more human…? Well, strangely enough studies have shown that dogs do have some unique, almost human traits and abilities. Because they have co-existed with humans for so long they are hard-wired to pick-up on human social cues. They can actually ‘read’ us. We all know that dogs can learn words and commands. How many times do we have to spell out W-A-L-K, L-E-A-S-H, or C-A-R in the hope we can fool them! Even glancing over to the leash hanging by the door can get Fido jumping to attention and tail a-wagging. That is probably because dogs actually tested higher than one of our closest ancestors the chimp, and higher even than kids at something called “social cognition”, that means basically that they can read our gestures, take cues, and even manipulate and predict human behaviour! Treating them as little family members does have its drawbacks though. When the cute-factor climbs, so does our tendency to spoil them. Your dog has its own website. You feed the dog the same dinner you’re having. You say sit and the dog backs over to a carpeted area and then sits. Your dog has more than one item of clothing (their collar counts as one). You end up huddled on a tiny strip of the bed while the dog gets the rest (apparently 40% of dogs sleep on their master’s beds). You often make the Freudian slip of writing ‘God’ instead of ‘dog’. Your dog is getting credit card offers in the mail. You go out for a drive just to give the dog a ride in the car. Your dog has to be tucked in when it goes to bed. Your dog drinks tea, but only with milk and sugar. We do love our pets. They are family, and we know they will always have a place in our hearts—and in our homes.